This is an observation often offered by both parents and teachers about young children. Contained within it is a central, albeit hidden, assumption; namely, that “sight words” represent an inferior form of reading –a form that falls short of “real reading.” Is this, in fact, the case? This interpretation is a by-product of the instructional process — a process that is dominated by “phonics” or “sounding out.” While phonics adherents would wish every word could be sounded out (as it can be in some languages such as Italian or Spanish), English does not allow it. One of the core problems rests with a group of very common words (such as who, the, does, she, and are) that would sound quite weird if you placed a sound on each letter. Yet they are essential to the language and therefore cannot be ignored. Because there is no method for teaching these words, they receive little instructional time. In the main, the teacher writes them on cards, holds up the cards and asks the children to say what they are. Essentially this is not teaching, but testing. In other words, in reading instruction “sight words” is a term that represents words for which there is no established method of instruction. This seems to be the source for perceiving the knowledge of “some sight words” in a negative light. It is really a reflection of the values of the teaching process rather than a reflection of a child’s abilities. Instant word identification, aka sight word reading, is what you are doing now. There was probably not a single word on this page which caused you to pause and resort to the strategy of “sounding out.” Indeed, if you had to sound out even 10% of the words on this page, the process would be so onerous that you would simple abandon the process. What all this means is that sight words reflects the process of reading that all effective readers use and it is the process that makes reading smooth and feasible. 2. show the paper to your child, say “Look at this.” Then cover the word so that it is out of view. 3. with the word covered, you ask your child to write the word. 4. if your child makes an error in writing the word, you immediately stop him or her, completely blacken out whatever has been written and repeat the process (of showing, then hiding the word). 5. there is a variant of the technique that encourages greater mental imaging of words. In it, the model that you offer contains some missing letters. At the same time, under the incomplete model is a set of letters that contain the missing letters along with some irrelevant ones. (e.g., catch might be shown as __ a t c __ with b c e h n underneath.) To be able to write the word, the child has to mentally select the missing letters and combine them with the incomplete word. The basic technique (of seeing a clear model, but writing only in the absence of the model) encourages a child to look carefully at the set of letters that compose a word. By repeating that process over many words, the basic visual skills for effective sight word reading fall into place, with fabulous results for effective reading. 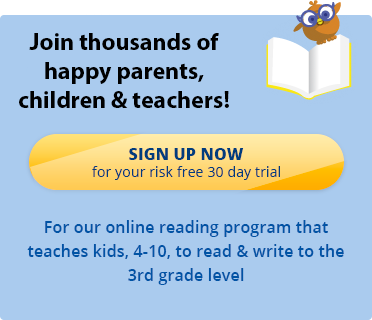 Try the Reading Kingdom with our free 30-day trial here.